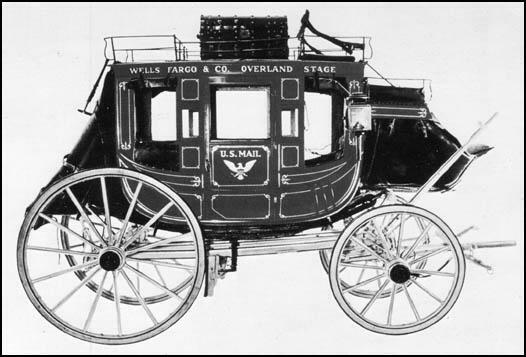 In 1852 Henry Wells and William Fargo established the Wells Fargo Stagecoach Company in San Francisco. The two men purchased Concord coaches built by the Abbott-Downing Company in New Hampshire. The coaches varied in size and could seat six, nine or twelve passengers. The larger coaches could carry up to a dozen men on the roof. The coaches were pulled by four or six-horse teams. Next to the driver at the front would sit an armed guard. The coaches had leather storage compartments (boots) at the front and back of the coach. The compartment under the driver's seat usually carried the strong box where the passengers kept their money and valuables. The larger boot at the back carried the mail and the bags of the passengers. By the 1880 the Wells Fargo Stagecoach Company had 573 offices and agents. It was now the most powerful stagecoach company in the American West. However, it began to invest in railroad companies and in 1888 Wells Fargo established the first transcontinental express via rail.